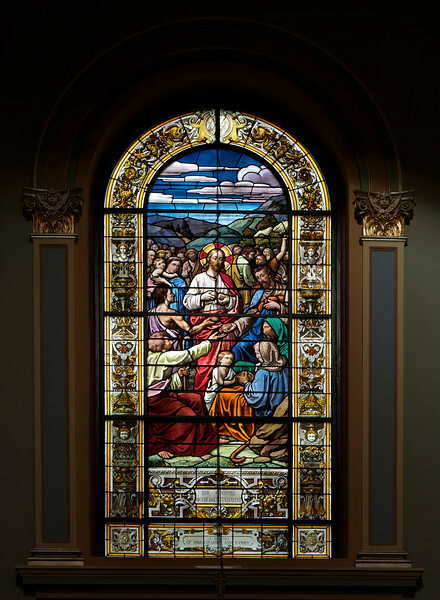 "Saint Jean Baptiste features several sets of stained glass windows. The most important and visually dominant are the windows of the nave (including the apsidal chapels) and clerestory (second level). These beautiful windows were designed and crafted by the Chartres, France, atelier of Charles Lorin between 1914 and 1919. Due to the danger of shipping during World War I, they were kept in France and, therefore, not installed until 1920. Along with the Lorin windows in Saint Patrick’s Cathedral, these are the only examples in New York of the superb craftsmanship of this workshop.